Posted by CCLD in Bookmobile. There’s a lot happening this summer with the CCLD Bookmobile. We are so excited to announce 3 new stops beginning soon. Fairport Terrace, Wygant Road, Horseheads, every other Thursday 4:00-4:30pm beginning July 7th. Hickory Grove Apartments, Horseheads, every other Monday 3:45-4:30pm beginning July 18th. Wesleyan Church, Beavers Dams, every other Wednesday 1:00-2:00pm starting on September 7th. Besides new stops, CCLD Bookmobile will once again be visiting all the Summer Cohesion Sites, Big Flats Parks, and the Southport Parks. We actually see 700-800 children per week! The children will select books to read during the week and then return the following week to choose more. Each summer, Bookmobile staff looks forward to seeing familiar faces and meeting new children too. On July 26th the Bookmobile will be hosting a special performer. Jim Cruise, The Spoon Man, will showcase his spoon playing talent in an interactive comedy routine. Families can come to one or all performances at the parks in Elmira’s Southside – Goodwin Park 9:15am, Chapel Park 9:45am and Draxler Park 10:15am. These are 20 minute performances. At 3:00pm, a full hour show will be held at the Southside Community Center. You’ll have more opportunities to visit the CCLD Bookmobile in 2016 at special community events. August 27th: Wellsburg Community Days where there will be venders all day and a parade at 2pm. If you see the Bookmobile stopped or parked, don’t be shy, come aboard and see what we have to offer. It’s not just for children. In fact, an Adult Book Discussion Club meets the 1st Friday of every month at the Bulkhead Hardware parking lot. The book title is announced the previous month and is posted on the CCLD website’s Calendar of Events. If you can’t join the group, call Kim Jones, the bookmobile driver, and let her know how you liked the book. She and her staff are always eager to answer any questions you may have or to assist with book, audio book, and DVD selections. Don’t hesitate to call 738-2476. See you soon! Posted by CCLD in Youth Services. 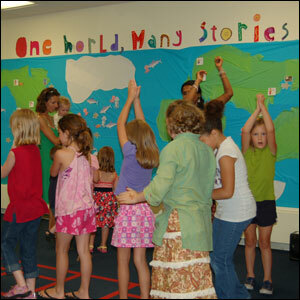 The Summer Reading Club for kids will kick off the week of June 27th with the theme, “On Your Mark, Get Set…READ!”. Activities for kids at our local CCLD branches, include: Puppet, Magic and Outdoor Game Days, as well as CCC’s Planetarium, Science Tellers and a performance of “The Tortoise and the Hare” by the Merry-Go-Round Theatre. There’s so much more, and best of all…completely FREE! Signups start June 27th, either online at www.ccld.lib.ny.us or stop in at your local branch. Once you sign up and start reading, remember to stop in weekly at your local branch for prizes and the club event of the week. All readers who enter and report their progress online or let us know, will be invited to an ending party at Eldridge Park, sponsored by the Friends of CCLD. Parents, remember this is a great way to get your child to keep reading over the summer months, and avoiding the “summer slump” or loss of reading skills. For the tweens (8-13 years) out there, we will be offering a Theatre Camp and a Maker Camp, stay tuned to our website for more details on these! Posted by ackermanj in District News, Steele, Youth Services. Posted by ackermanj in Youth Services. 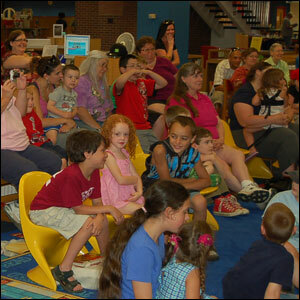 Central (Steele) Library has been selected to be one of the official NY state launch sites for this year’s Summer Reading Club, in conjunction with S. Tier Library System and the NY State Library. We are thrilled to be hosting this special event, on Tuesday June 25 from 6:00-8:00, and the evening will include fun “stations” for the kids to explore around the theme of “Dig Into Reading.”Stations will include face painting and tattoos, a dinosaur excavation site, a special craft, a visit from Booker, refreshments and a 7:00 performance by the Bubbleman. State dignitaries will be on hand to deliver short speeches about the importance of summer reading, and some will also read to the kids. Staff will also be on hand to let kids know how and when to register at their CCLD branch for the club. Studies have shown the importance of reading over the summer months, as it allows students to maintain educational advances. Our weekly programs which will run for 6 weeks, will engage the children with entertaining and educational programs…all for free! For more information about the importance of summer reading, please visit http://www.nysl.nysed.gov/libdev/summer/research.htm. Posted by poppendeckc in Youth Services. The Summer Reading Club is getting wonderful attendance from our patrons! We have had great programs, and all are being met with enthusiastic response. Our Faustwork Mask program launched the SRC here at Steele and at West Elmira and Horseheads libraries. It was a one-man show, with lots of masks that tickled young and old funny bones. Next we enjoyed a mini Epcot program, with representatives from countries around the world. There was food, dancing, and learning about world cultures. This program was so popular, we have been asked to repeat it next year! We had a visit from Corning Community College’s portable planetarium. It looked like a big silver balloon, and inside the children were introduced to the summer constellations. Outside the planetarium, the children made crafts, envisioned what it is like to be an astronaut, and even sampled astronaut ice cream! 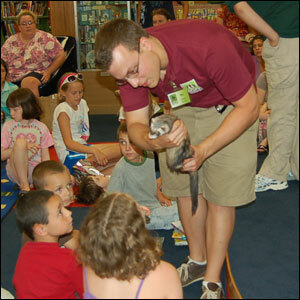 The latest event was a visit from the Binghamton’s Zoomobile, where the audience enjoyed visits from an owl and a ferret, among others. Audience members were invited to touch the ferret and the corn snake. Trivia qu estions were asked and prizes given. Two more events are up and coming. Please check our schedule for dates and times. It is not too late to sign up for the Summer Reading Club, which keeps the kids in your life connected to their reading skills and is a very enjoyable way to spend some time! Posted by CCLD in Horseheads, Programs, Steele, West Elmira, Youth Services. The Mask Messenger is a series of vignettes ranging from comic to bizarre to poignant. Body language, psychological insight, and humor are the driving forces that captivate audiences ranging in size from 200 to 1200. The show, available in solo or duo performance variations, illuminates and expands the concept of the mask, exploring its relationship to human psychology, business, fashion, art, dance, and theatre. The set consists of an impressive collection of masks, created by Mr. Faust and the company, exhibited center stage. After a brief and informative mock-lecture about the myriad uses of masks in cultures throughout the world, the performers begin to demonstrate the power of transformation by removing the masks from the wall, and assuming the emotional state expressed in each face. A variety of characters spring to life, including some who speak dialogue, wearing Commedia Dell’Arte style half-masks. 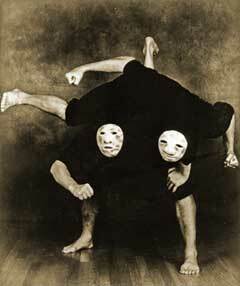 Full masks are worn on top or back of the head, creating distortions that baffle the eye and tickle the funny bone. The success of The Mask Messenger/s is due to the fact that it offers not only comic exuberance, but also new insights into the artistic, cultural, and historical aspects of the mask. The show has been performed over 2000 times at festivals, corporate events, universities, and in theatres throughout the United States and the world.